This entry was posted on Monday, November 15, 2010 and is filed under Historical Romance, Traditional Publishing Stories . You can leave a response and follow any responses to this entry through the Subscribe to: Post Comments (Atom) . I've loved all of Susan's books but Fraiser Island is my favorite. Please include me in the drawing. Thanks! That's sweet of you, Merry. Thank you! Frasier Island resonated with a lot of people, I think. Blessings! Glad to have you drop by today, Susan! 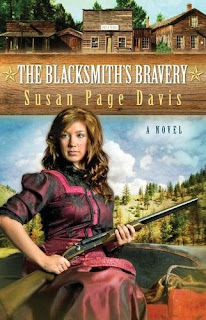 Hi, Susan, looking forward to getting THE BLACKSMITH'S BRAVERY. I loved the first two. I think the slower romance is nice. God bless you. Hi, Sharon--glad you're enjoying the series. Misty, I wish your husband success, and I hope he has a strong back! When I learned to shoe horses in the late 1970s, I learned what hard work it is! Getting those old shoes off is maybe the hardest physically. I still love horses, but I haven't shod one for a LONG time. Susan, Thus far I have bought The Crimson Cipher and Mainely Mysteries. I haven't read your Ladies Shooting Club series yet, but would love to win The Blacksmith's Bravery. Nice way to be able to find new authors to follow! And the winner is... Kaye Whitney! Send me your address and I will get it right off to Susan so she can send you the book. I am very excited to win this book, especially on my mother's birthday. Had she lived, she would have been 104 today; she has been with the Lord since 1985. "The Ladies' Shooting Club" - love it. Strong heroines in historical settings are always a winner with me. Love the cover work.